Steeler fans have spent the last four days micro-analyzing No. 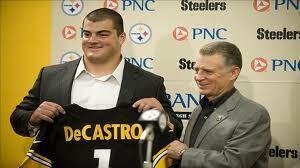 1 draft pick David DeCastro, an offensive guard from Stanford. They want to know if he’s agile in picking up the blitz, if he can pull to block on the sweeps, and if he’ll protect the quarterback’s blindside. My question has more to do with wardrobe: where will they find a helmet to fit him? His head appears big and durable enough to, with proper modifications, serve as an actual helmet for other professional football players. I swear, I can’t recall seeing a larger tusk-less head in my entire life. I’ve lived in less spacious apartments. News reports say he’s 6-5, 316 pounds. Judging from the pictures I’ve seen, that’s just from the neck up. The average human head weighs 10 to 12 pounds. For those of you who’ve never seen or picked up a severed head, try to imagine a lop-sided bowling ball with ears and two extra holes to stick your fingers in. DeCastro’s head reminds me of Abraham Lincoln’s, the cement one on the monument in Washington. He’s spent the last few days answering questions about his work ethic, his goals and his eagerness to be a Steeler. If I were a sports reporter, I’d ask how many years his mom walked funny after he was born. This doesn’t always go over as well with first-time mothers as you’d think, but the more children a woman has delivered the more grateful she is for my concern. I think part of the problem is some women, many of them in the throes of hormonal insanity, confuse small heads with lack of intelligence. This couldn’t be further from the truth. There is no correlation between a child’s head size and how intelligent he or she will become. That the majority of children, indeed, grow up to be adult morons is beyond my explanation. A small-headed child is truly a blessing for a mother, especially the earthy ones who foolishly shun epidurals. I tried to persuade our OBGYN to administer a second epidural, this one to me, and the only pain I was feeling was from my wife squeezing my hand too tightly. It would be a lot easier for the prejudicial among us if all the stupid people did have baseball-sized heads. Imagine how much more efficient it would be for an employer to weed out unqualified applicants if all he or she had to determine was cranial capacity. Some very cursory research reveals that most of our presidents would have failed the barrel hoop test. In fact, if his nose were just a bit less prominent, you could have played ring toss with Andrew Jackson’s post-like head. One of our most cerebral presidents, William Howard Taft, had a huge head and there was lots going on inside of it. He’s the only man to have been elected president (1909) and then be appointed Chief Justice of the U.S. Supreme Court. And here’s something the historians won’t share: Taft would have made an outstanding Steeler lineman. At 335-pounds, he was our country’s largest president and had served as U.S. Secretary of War from 1904-08. Those are the kind of credentials draft experts find impossible to ignore. All this overlooks one fact that leads me to believe big-headed DeCastro is, indeed, super-intelligent. He attended Stanford, one of the top schools in America, and studied management, science and engineering. In fact, it’s not impossible that a man imbued with his combination of brain power and brute strength will be propelled to national popularity that one day might lead him into politics and a legacy even larger than that of ample old Taft. But that, for now, is wild speculation. Despite the topic, we shouldn’t get ahead of ourselves. Steelers to childbirth to Taft. Great post! Ah, thanks, John. Hey, send me your address, please. 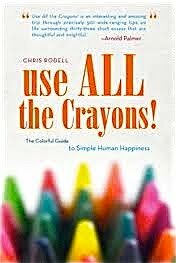 Have something for you.